If DFS tight end strategy was as simple as auto-play Gronk you wouldn't be reading this article and I wouldn't have needed to write it, but selecting the right tight end in DFS is more nuanced than that. Here I'll show you the makeup of a valuable tight end, how to identify the top values in a given week, and how to tailor your approach at the position to whether you're playing in a cash game or a tournament. Opportunity drives a tight end's fantasy production more so than efficiency does. 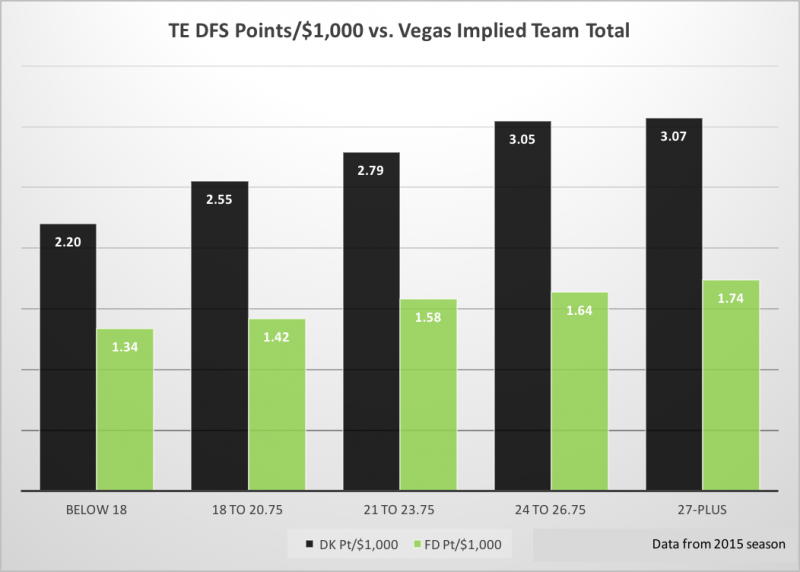 It's very tough for a tight end to put up a worthwhile DFS game if he doesn't see at least eight targets: of the 49 games where tight ends scored 20 or more DraftKings points last season, 78 percent had at least eight targets and 58 percent had 10 or more. Even getting to 15 DraftKings points required eight or more targets 63 percent of the time. Targets are also the most predictable week-to-week stat for tight ends. With receptions and yardage combining to account for roughly 75 percent of the average tight end's production, an increase in targets leads to a higher floor and a higher ceiling. Among the skill positions, tight ends are generally going to see the least amount of opportunities over the course of a game -- they were targeted only 21 percent of the time in 2015, compared to 59 percent for wide receivers. Tight ends also see mostly short targets, so they don’t have as much yardage potential as wide receivers, either. In fact, only two tight ends averaged more than 60 receiving yards per game last season, compared to 27 wide receivers. Tight ends’ relative lack of yardage potential makes them highly dependent on touchdowns to maximize their upside, which is where red zone targets come in. Despite being outside of the top 10 in targets per game (5.7) in 2015, Tyler Eifert finished as a top-five tight end in points per game due mainly to his 11 red zone touchdowns made possible by his top-five standing in red zone targets per game (1.27). His 68.9 percent touchdown conversion rate is almost sure to regress, but you can't take advantage of that type of positive outlier if you don't put yourself in position to do so by rostering tight ends that see a healthy amount of red zone targets. Over 90 percent all touchdowns scored by tight ends over the last three seasons have come in the red zone. Fantasy-wise, red zone targets are worth more to tight ends than the other positions. Over the last three seasons, tight ends converted red zone targets into touchdowns at a rate of roughly 32 percent, far better than that of wide receivers (23) and running backs (18). So as long as a tight end is getting red zone targets, he generally has an above-average shot at converting them into touchdowns relative to the other positions. The higher the team total, the more points per dollar a tight end produces. This is a great way to find under-the-radar GPP plays in the mold of Jacob Tamme in Week 8 of 2015, who was lightly owned but posted a 10-103-1 line for the Falcons team that had an implied total of 27.8 that day. Home favorites have averaged the most passing yards (265) and touchdowns (1.8) of the four possible combinations since 2013, and it looks like those passing numbers end up trickling down to tight ends. 4for4's schedule-adjusted fantasy points allowed (aFPA) is particularly useful for tight ends because the skill set and role of a tight end in each NFL offense greatly varies. Some teams have bonafide receiving threats at tight end, while others have more in-line blocking types. Receiving tight ends usually get open by either beating a linebacker with speed or beating a safety with size, and some of the more athletic types, such as Rob Gronkowski and Jordan Reed, can split out like wide receivers and create mismatches, which is especially effective in the red zone. Less athletic tight ends can generally be the most productive against zone defenses that are focused on protecting against the deep ball and thus allow the tight end to sit down for minimal gains underneath. Another scenerio that can occur is an effective opposing pass rush forcing a tight end to stay in and block, decreasing his opportunity to run routes and accrue targets. There are more shutdown corners in the league than tight end stoppers, but one of the latter that stands out is Chiefs safety Eric Berry. The Chiefs allowed the second fewest PPR points to tight ends in each of Berry's last three full seasons. Since 2008, tight ends on the injury report have seen an 8.5 percent dip in fantasy production, and there wasn’t a difference between probable and questionable tags. Since most tight ends are less athletic than wide receivers, lower-leg injuries that sap additional speed or agility are particularly detrimental to fantasy production. Knee and ankle injuries can be especially problematic, on average causing a double-digit percentage dip in production for a tight end compared to when he is fully healthy . What Makes a Tight End Cash-Game Viable? There’s no need to be afraid of saving some cash at tight end in cash games if you need to because if you’re going to save, you should generally do so at one of the lower-scoring positions. Tight ends were collectively responsible for only seven of the top 100 DraftKings points per game averages in 2015 (min. six games). 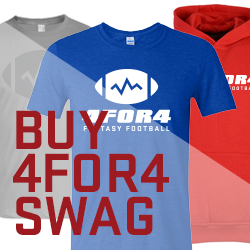 That means the majority of tight ends will be inexpensive, and whiffing on an expensive one can set you back. Another reason to save when you can is that tight ends are a volatile, touchdown-dependent position. They tend to have the largest weekly fluctuation in fantasy points, resulting in a low weekly floor relative to their average performance. We can measure volatility by dividing standard deviation into the mean, which gives the CV (coefficient of variation). The lower the CV, the higher the floor. Last season, only two tight ends had a DraftKings point CV below 50 percent, compared to 27 quarterbacks, 14 running backs, and 12 wide receivers. Success at the singular positions in a GPP is all about having the top scorer at the position. That’s reflected in the table below, which shows the median salaries and ownership percentages of each roster slot in the DraftKings Millionaire Maker and the FanDuel Sunday Million. Although it may look like winners don't allocate many dollars to tight ends relative to other positions at first glance, keep in mind the salaries fall in line with what an average tight end would cost in a given week. While you should be conservative with your cap dollars at tight end in cash games, you need to be willing to pay up if it means securing the tight end with position-winning potential in tournaments. At the same time, keep in mind the moderate median salaries at TE in winning lineups if you’re one of those owners who finds themselves with Rob Gronkowski in almost every lineup -- odds are there will be at least one lower-cost option who posts similar production that week. Since you only need one tight end and there are usually limited options in a given week, the tight end slot doesn’t lend itself to contrarian selections as well as some of the other lineup slots. This is especially true on DraftKings, where the full-PPR scoring system makes tight ends easier to project than on sites like FanDuel that have half-PPR scoring. 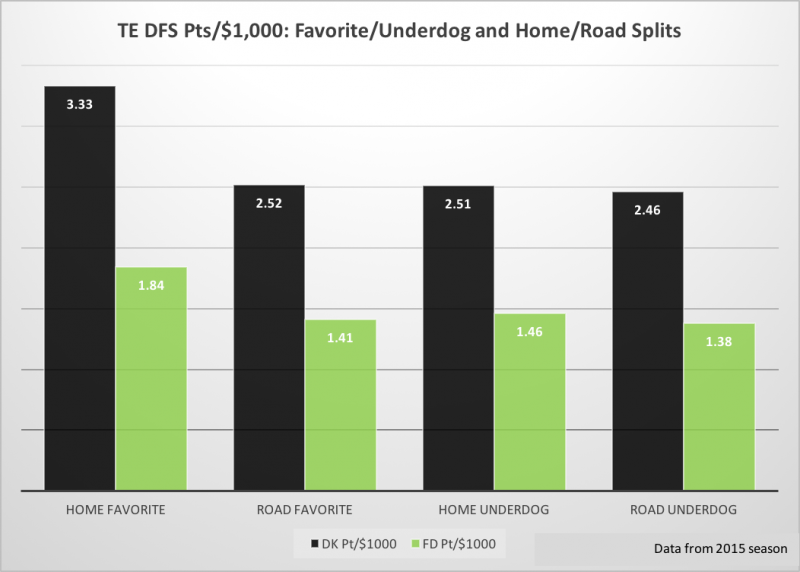 Tight ends accounted for fewer than five percent of 40-plus point games on DraftKings over the last three seasons, so it’s not surprising they were absent at the flex slot of each of winning Millionaire Maker lineup last year. 4for4's DFS Subscription has site-specific lineup generators (now with floor/ceiling projections), stack value reports, and tons of in-depth content and more. Sign up here!